The new missile will reportedly carry a warhead capable powerful enough to destroy North Korean underground military facilities. 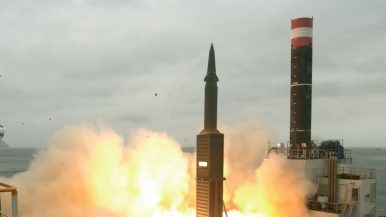 In a report for an annual parliamentary audit by the South Korean National Assembly’s Defense Committee, the Republic of Korea (ROK) Army announced that it is working on a new surface-to-surface ballistic missile, likely designated Hyunmoo IV, capable of destroying North Korea’s underground military facilities and command centers. The new weapon system, which provides the ROK Army with an advanced pre-emptive strike capability, is designed to inflict “unbearable cost” on North Korea at the outset of hostilities, the army said. “We would use those three types of missiles as the first salvo of the missile strike and concentrate them during the initial phase of war to destroy North Korea’s long-range artillery units and missiles located in ballistic missile operating area,” the report reads. In a bilateral agreement signed in 1979, the United States and South Korea set out guidelines about the specific payload and range of the latter’s domestically developed missiles in order to avoid a regional arms race. These guidelines were updated in 2012. However, while South Korean missiles can have now an extended range of up to 800 kilometers (about 500 miles), the maximum payload remains unchanged at 500 kilograms (1,102 pounds). In a September telephone conversation, U.S. President Donald Trump and his South Korean counterpart, President Moon Jae-in, agreed in principle to scrap warhead weight limits for South Korean ballistic missiles. The U.S. Department of Defense in consultation with the U.S. Department of State is in the middle of reviewing next steps to accommodate South Korea’s request. The new Hyunmoo IV will likely be fitted with a new 1,000-kilogram (2,200-pound) warhead and is probably a variant of the extended-range Hyunmoo (likely designated 2c) missile currently under development. The new Hyunmoo missile, with an estimated range of 800 kilometers, has been repeatedly test-fired in 2017. According to ROK Army reports, the new missile’s payload remains pegged at 500 kilograms. However, the missile could quickly be modified to accommodate a heavier warhead. The extended-range Hyunmoo missile is expected to become operational by the end of 2017 following two more rounds of test firing. The ROK military currently deploys two ballistic missiles, the Hyunmoo 2A and 2B. The extended-range Hyunmoo is an improved variant of the Hyunmoo 2B. It is unclear when the new Hyunmoo IV, a deep precision-strike capable missile, will be operational. The leaders agreed to completely remove limits on the payload of South Korean ballistic missiles.